This Palram 6ft x 5ft Green Skylight Plastic Shed is ideal for gardens of all sizes, providing a secure space to store away outdoor items and gardening tools and equipment. Perfect for those looking for a maintenance free shed, this plastic storage unit is made from UV treated, polycarbonate panels and robust aluminium framing. UV treating the panels prevents discolouration and cracking over time, and complete with a ten year anti rot guarantee, you can be sure that this garden shed will look great for many years. For a straightforward construction, Waltons plastic sheds feature an innovative slide and lock system. 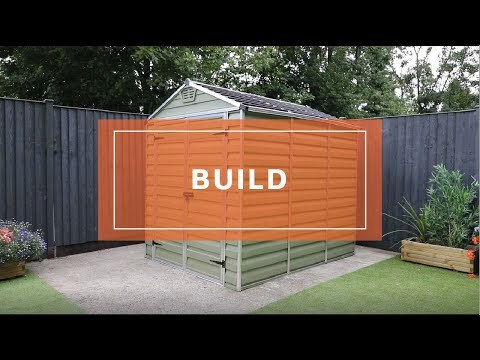 For additional strength and security, this shed can be bolted down to a solid, concrete base. An anti-slip floor is supplied as standard to ensure safe use and that items are kept dry and protected. Integrated air vents at the front and back of the plastic store allow air to circulate, preventing the build-up of condensation, protecting belongings from potential damage. A unique skylight roof allows natural light to filter into the shed for easy storing, whilst maintaining an opaque exterior, keeping your items secure and out of sight. Double doors provide easy access into the plastic storage shed and can be secured shut with the supplied pad-bolt. Review:Made with low quality material - very flexible, not strong or supportive, bends very easily, even if something falls against it - not what you want from a shed. The item that you ordered is supplied direct from a third party and as such we do not see the item, we did try to sort your problem with you and believed a satisfactory ending was achieved. Review:All parts were labled which made it easy to put together. Does need 2 people and best done on a none windy day. Instructions easy to follow. Review:Good value shed which once erected is quite sturdy. Perfect for our needs as a toilet at our bowls club. Review:What free floor! Misinformed I was getting a good deal. I am so pleased that you are happy with the quality of your plastic shed and that it is perfect for your needs. Thank you again for your great review! Review:Slightly more difficult to assemble than shown. It took 3 people to put it together however it was a windy day which made things more difficult. Otherwise I'm very happy with it. I am sorry to learn that assembly was as straight forward as anticipated but glad that you are happy now the item has been erected. Thank you again for your positive review - it is much appreciated. It is great that you are happy with your plastic shed and the sturdiness of it once erected. I am glad you also found the assembly to be fairly straight forward and good value for money. Thank you again for your positive feedback. Review:Nice looking shed but a little flimsier than we expected. I am glad you are pleased with your plastic shed and should you have any queries, please contact us on either 0800 029 1000 or service@waltons.co.uk. Thank you again for your review. Review:Just as expected and fairly straightforward to put together if you're used to that sort of thing. Thank you. I am glad you are pleased with your plastic shed and assembly was straight forward for you. Thank you again for your feedback! Our Reply:I am thrilled that you are happy with your plastic shed and that assembly went well. Review:The shed is great and does exactly what we bought it for. Putting it together is a tedious process however and we feel it's overpriced from a quality/price perspective. Would not buy again. Our Reply:I’m really sorry that the assembly did not run as smoothly as anticipated. I am glad that the shed is serving the purpose it was purchased for although I am sorry to hear you think it is overpriced. We take all of your comments on board and thank you for taking the time to review. 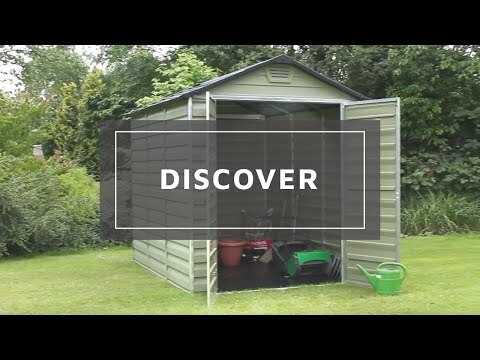 Review:Great Shed very happy with item. Our Reply:I am very pleased to know that you are happy with your plastic shed. Review:Inside the shed look good with the skylight roof and the floor makes it, very pleased with it.